We are enjoying GORGEOUS Spring weather here in Pittsburgh. It's sundresses and sandals weather, and I love it!!! Summer is coming! Lily wears a dress almost every day when the weather is warm. They are cute, and easy for her to move around in! Lexie loves skorts and shirts for school. Her outfits are comfortable, but still look dressy, which is what she prefers! She can easily go from class to playground without an outfit change! I knew it was coming, but he held off for SO long. Now Dylan is all about sporty clothing. Adidas, Puma, and Nike it is! I keep finding amazing clearance deals on baby girl items! Although I do not know what I'm having, I am set. If I don't have a baby girl to wear all these adorable items, my awesome friend IS having a baby girl a few weeks after me. So I have no problem dishing out a dollar or two on some cute things! I mean, really, how could I resist these for $1.50 each?!? 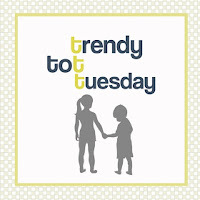 Love these trendy tot Tuesday posts!! So cute! WOW 1.50 on those, yes! So cute! I'm going to keep my little girl in a dress as long as I can! Love Dylan in his sports wear! I can see you're starting to gear up for the baby :) So cute! I'm glad you're having good weather - it's been cold and rainy here for days! Those baby items are so cute! Your children are so adorable! And well dressed! Congrats on soon-to-be baby #4!! So cute! Elly has the same skirt that Lexie is wearing. Gotta love Target! You are always finding such great deals! I love the socks! Those newborn sets are pretty irresistible!